As a kid, I loved those Sunday mornings when my parents were too tired for church and we‘d just lay around. The highpoint was always sitting in the dining room while chatting with the Big Guy as he’d make his secret recipe pancakes. Years, later, I figured out the the secret was adding vanilla to bisquick. Once again, the big Guy gets one over me. Kim and I have started a similar routine and I love it. By nature, I am a morning person but have never been too crazy about it. Waking up at a gentlemen’s pace makes the whole process better. Somehow, now I make the pancakes and I also have my own secret recipe borrowed from food network. 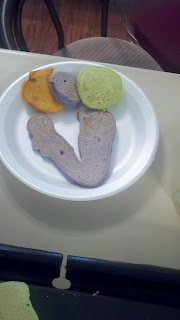 Just to amuse the kids I’d make funny colored pancakes. 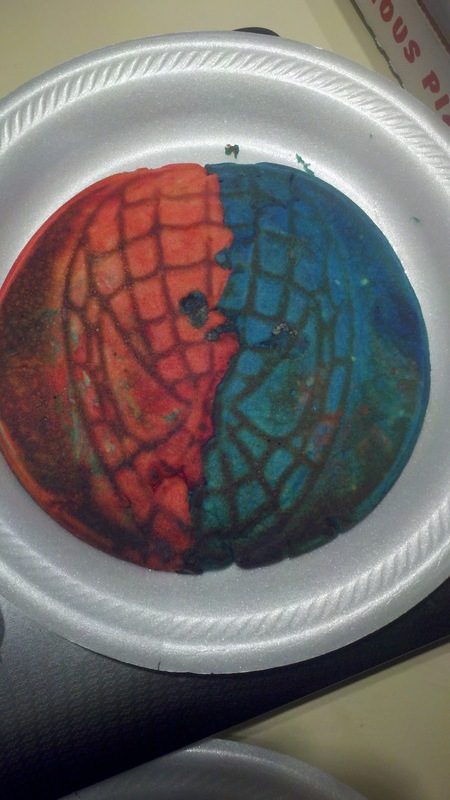 ...does whatever a pancake can. I was hobbling back to my room to get some forgotten item when I passed a box in the living room. Due to my dialysis supplies, I always have a few boxes around my bedroom door or about to go out front so I thought nothing of it as I walked by. The problem came when the damn box began to shuffle and giggle which scared me so bad I almost slung coffee against the giant Errol Flynn Captain Blood print I own. I looked down to see my step son had taken two boxes and made some sort of contraption. Jude began giggling his little laugh that I love to hear. He was clearly amused by the situation. Jude popped back,” I’ve built a secret lab for me and Cuddle bear to play with.” Cuddle bear is Jude’s sidekick. He is a panda from Build-A-Bear and Jude’s constant night time companion along with his lightsaber to fend off the dark. “A secret lab, eh? What are you trying to build in there? Looks a little cramped.” I asked. Well, ask a stupid question, I thought to myself. At this point Jude grabs the top of his lab and flips it shut. Overall, the whole thing was pretty ingenious. The lab lid could flip up and become a sidecar for Cuddle bar as they would race through the space time continuum. Along the sides, he’d written “Nothing to see’, “Top Secret,” and my favorite “Don’t Peek.” At one point Jude and Cuddlebear were making their own Kessel Run and it hit how much this reminded me of a Calvin and Hobbes strip. Next to Peanuts and Bloom County, Calvin and Hobbes had to be my favorite comic strip to read in the papers. For years, I held on to the last strip and always had it posted in my dorm rooms, camp cabins, and first few houses. I think the charm about Calvin and Hobbes is that we all remember being that seven-year-old kid and how your imagination could fuel a whole afternoon of fun. To a seven year old, a box could become anything with a little time, effort, magic markers, and a knife. Watching Jude play in his secret lab reminded me of my old refrigerator box; excuse me, my old secret cabin getaway. The Big Guy had brought home a grill and I started playing with the box much like what Jude created except it myself and my sidekick, Pluto. My father had so much fun watching me play in that old box that one day he surprised me with a refrigerator box with the instructions that I could do anything. First we cut a window so I could get some light and then worked on a door. I got an old blanket to make a rug for my floor. The “cabin” fit perfectly in the den so I could spend time in my getaway cabin yet still be able to watch The Brady Bunch from my back porch. After a while, I rigged some shelves for my comics and snacks using more cardboard and duct tape. The outside was spectacular. Along one side I went with a Six Million Dollar Man motif complete with Steve Austin completing a long jump that ran the span of my new cabin. I even drew Oscar Goldman, Steve’s boss, with a little cartoon bubble. I still remember what he said to the Bionic Man. Sadly, the comics were always much better than the actual show. The other side of the box was decorated as if I had stepped into Sherwood Forest because I was heavily into my Robin Hood phase. 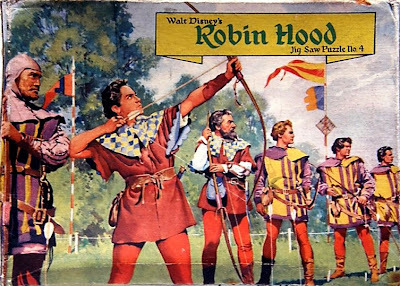 I had drawn the famous archery contest where Robin splits the arrow in two. This was nicely accentuated by drawing the arrow running the length of the “cabin.” Not too shabby. To say that Jude and Veronica have many toys and devices to choose from to spend their time is a bit like saying that Italian Cruise boat Captain might have not used his best judgment. They have their Nintendo DSs, a Lego Millennium Falcon and Queen Anne’s Revenge plus the Kinect that I bought them. Yet, I am thrilled to see them choose two boxes that I was going to throw away and create something fun. I find it ironic that it’s my job to be teaching them about how the world works as the adult with full supervision privileges. Yet, these two kids can look at the world and still find wonder just by playing with two boxes. Talk about the student becoming the Master. Imagine the type of world we’d live in if more people could act that freely. What Do You Mean We Have to Plan a Wedding Now?